Made a stop for lunch in Morris Illinois on my way to Kewanee another 90 minutes down the road. After some Swedish meatballs at R' Place, we quickly made a jaunt over to St. Vincent's and Goodwill to hunt for some treasures. St. V's was up first...I don't think I've ever seen a collection of vinyl so carefully oriented towards a singular genre/style: country. It had to be 99% and as the collection was not very big, that meant only 1-2 records did not qualify. Obviously, the LP in the front of the bin did not make the cut in that regard, but it was then followed up by a nice segment of Alabama's discography. I passed on 'Mountain Music' and my girl grabbed it - I regretted it within the hour. It was in really prime shape. Another wonderful anomaly about this place was the 45 bin. I usually don't waste my time digging through 100 scratched 'naked' records without jackets but I don't think there were more than one or two (out of at least 30) that were left uncovered. 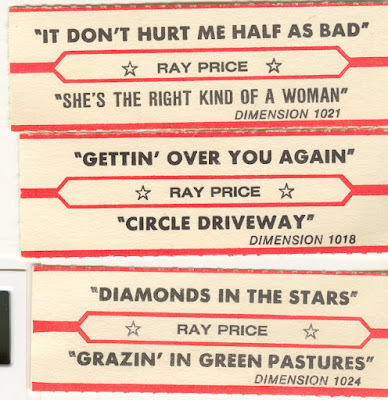 My eye caught a Ray Price 7" but I let it go as I was not familiar with either the A or B side. As the vast majority of his resume is on Columbia, I did not know if the odd record label here was distinguishing this as being from perhaps the mid 80s or what. I continued leafing through the basket and quickly found another: same obscure record label and again two more tracks I did not know. Again, I left it behind. Just moments later I found a third, and struck gold with the B side which is one of my favorite tracks on 'For The Good Times' (which I own in Quadraphonic - and got for free!). As I had not found an LP yet to purchase and most of the 45s were not interesting enough, I had been setting the Ray Price 45s aside 'just in case'. 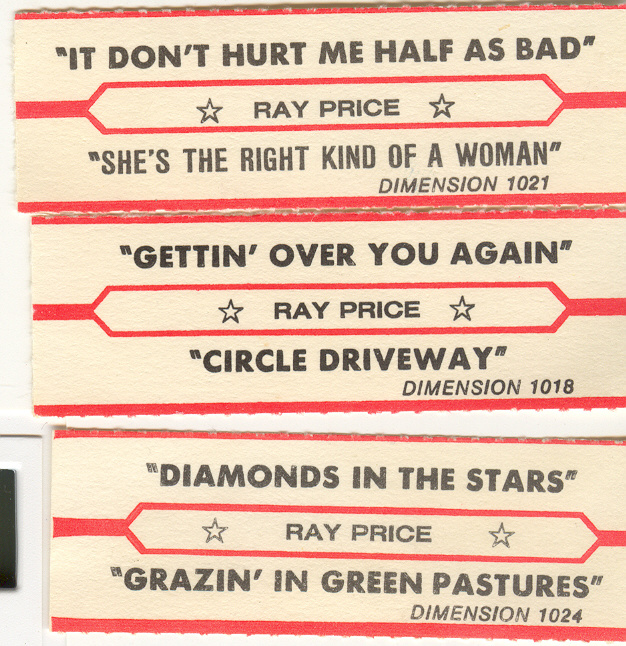 When I was done I noticed that all three had jukebox strips lodged in the paper sleeve! So I did indeed buy all of them. The song that drew me in is however re-recorded there in the early 80s (that font was a dead giveaway...I wasn't far off with my initial guess). This arrangement is in a lower key and had some slightly over the top fiddle in the first verse and even a marimba in the 3rd verse! The higher pitch of the original is fitting for the lyrical content which I always though bordered on cocky, which was even better given the tracks that proceeded it on the Quad album previously mentioned, which are anything but. As we were standing in line (my girlfriend also got some Pyrex/Corningware) I noticed a small shoe rack. I was wearing a pair of Nike Presto slipons that I have had for at least 10 years. At one time, I had as many as 4 different pairs - these were great shoes. This pair was still wearable but the smell inside was becoming unbearable - too many bike rides in the rain had created some serious wet dog smell to emanate from inside. Ironically, I had just Febreezed them to pretty good results the day before, for the first time. But there was a pair of white slip ons (no name brand) which were brand new with tags. We asked the clerk how much and after a moment the 'boss' emerged from the backroom to tell me only $3.99! I promptly changed my shoes and left them outside and put the new ones on. I have made a habit of leaving my used shoes in a place someone can find them when I feel they have run their course. As long as they are decent, maybe someone else might like to use them, or need them even.